People around the world are throwing support behind the now 101 day student strike in Quebec in defiance of a proposed 75% tuition increase. Last Friday, after the Cherest government responded to mass demonstrations by passing a bill (Loi 78) that places limits on its citizens rights to protest and increases the punitive powers of the police… many Quebec citizens, who are not students and have not yet marched against the hike, have been politicized. 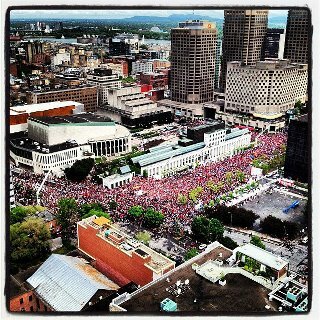 Demonstrations have multiplied in size and spread across all neighborhoods in Montreal. In addition to the university student and teacher unions, various trade unions have begun to thrown their support behind student unions, including the Montreal bus and metro workers who have come out against Loi 78 and have urged members to refuse transportation to police and to arrested protesters!!! Translating the Printemps Erable is an important resource for English speaker who can find translations of media coverage on the strike there. Please spread it widely. It is becoming increasingly clear that the student movement gaining momentum in Quebec at this time is about more than the cost of tuition but a blanket rejection of austerity measures dictated to tax-payers from the top down as a response to an economic crisis created at the top. To help contextualize the student movement in Quebec within collective struggles around the globe in 2012, here is an interview with Judith Butler. Award-winning author and prolific feminist scholar Judith Butler will be speaking tomorrow night at the Vogue Theatre in Vancouver. Dr. Butler will be presenting a talk entitled ‘A Politics of the Street’ in which she will examine the different forms of public resistance, protests and their implications for contemporary politics. “Media is very important in making certain links. News made through social media can be relatively uncensored and it undercuts or contests the more dominant media representations,” explains Butler, who sees protests in one part of the world having an effect on what is happening on the other side of the world. Dr. Butler received a PhD in philosophy from Yale University and is a professor at the University of California, Berkley. There she saw the student movement fighting budget cuts and defended some of the students against police brutality, even condemning the University administration for allowing it to take place. Earlier this month, Dr. Butler was in Switzerland where she presented at a conference at the University of Geneva on the topic of coalitions. She also just returned from visiting Israel and Palestine where she met with several different groups and she has a new book entitled Parting Ways: Jewishness and the Critique of Zionism, due out next month. Samantha Sarra is a freelance journalist based out of Vancouver. For more then a decade she has worked in television and print as a journalist committed to covering human rights, politics, culture and the arts. As an activist she volunteers for several organizations and currently sits on the board of The Shanti Uganda Society. This entry was posted in Hot topic and tagged Judith Butler, loi 78, occupy, revolution, stop the hike by venusradiockut. Bookmark the permalink.